Prior to the arrival of the Christchurch Adventure Park, Christchurch was known to locals for it’s mountain biking and varied terrain options, and to some tourists as that place that had a big earthquake and should probably be avoided. Despite the sea-side singletrack, nationals level downhill tracks, and 360-degree-view traverses, Christchurch has struggled in recent times to gain two wheeled traveler’s attention. It’s a popular spot to fly in to… and then drive out of… until now! The greatly anticipated Christchurch Adventure Park opened in December 2016 after an impressively speedy 8-month build. Located in Christchurch’s Port Hills, the Adventure Park boasts the southern hemisphere’s first 365-day chair lift. At 1.8km long, the lift is also the longest in New Zealand, and is the first purposefully designed lift for mountain bikers and their bikes. The park opened with 14 trails to ride, ranging from beginner to expert. As the NZ MTB experts, we naturally drop by for a visit when we visit Christchurch on our South Island MTB trip or our NZ wide MTB tour. Christchurch Adventure Park (CAP) has been the talk of the town since it opened. The small village, consisting of the customer service building, rental/repair shop, café, and pump track, is situated amongst looming pines and big skies. Even in the parking lot of CAP, one feels they’ve gone far away from any city, and definitely arrived on holiday. From flowing machine built tracks to rough and rowdy single track, there’s a trail to please every rider already- and more promised to be on the way! Two more expert tracks are nearly finished, The GC and Yoda, while plans for several more are in development stages. Cautious riders will enjoy the mellow turns of green trails like Dunkin Donuts, or perhaps the more swooping berms of blue trails like Lord of the Possums and Yeah Yeah Gnar. Riders with a bit more experience can check out classic Christchurch single track like the steep and playful Tommy’s 2 or the rooty and off-camber Alice’s. The only double-black trail currently open is the action packed Throw The Goat, which begins with a mix of sifty turns and flowy jumps and drops, but then turns on you fast with rocks, roots, chutes, and multiple option lines. The most unique feather, however, in CAP’s hat is the jump track, cleverly named Airtearoa. Get it? Aotearoa? Airtearoa. Just a little Kiwi pun going on there. Anyways, Airtearoa is the only trail in NZ of it’s kind, boasting 6 kilometers (!) of machine built jump track: tables, step ups, step downs, trannys, rollers, you name it. With over 80 jumps, this trail is, without a doubt, what CAP is already known for. While it should be attempted by skilled riders only, there are no large mandatory doubles or massive mandatory drops. Airtearoa an amazing asset to those with some experience being airborne wanting to practice and improve. Thank goodness for the chairlift, so we can do this track over and over again! Trail conditions at CAP are as varied as the tracks themselves. In the summer months Christchurch is prone to bone dry, dusty tracks – so be prepared for some skids! But even the smallest summer storm can cause grease patches in the trails, which makes for exciting riding and also makes riding within one’s limits a must! The rest of the year the dirt will vary from absolute tacky perfection… to absolute muddy mess! CAP may close certain trails if they’re getting thrashed or unsafe, but guaranteed there will be something exciting to play on at any given time. The chairlift itself is a sightseeing experience, ascending 365 vertical meters through pine forest, above rock outcroppings, and over sections of Airtearoa and Throw The Goat. The ride is smooth and swift, with bikes traveling ahead of riders in secure trays; all clearly the outcome of the latest and best in uplift technology. Sneak a peak behind you as the lift nears the top for sweeping views of Christchurch, Pegasus Bay, and even the Kaikoura Range. CAP is well marked, with large trail maps at the top, mid-mountain hub, and bottom of the lift. The information board at the top advises riders of trail status. Unfortunately, there are no water fountains at the top or bottom of the lift, so we recommend bringing a bottle or hydration pack along! With the rocky and changeable terrain, knee pads are a must, and full-face helmets and elbow pads are worth considering. Also, a spare tube and pump, just in case you find one of those rocks with your rim! There are water facilities inside the café, but even better… beer! Local brewery Cassels and Sons have scored the coveted taps at CAP, and boy are we pleased! What better to wash down a deliriously exciting and exhausting day than a crisp, hoppy APA? There’s a food menu too, and we must recommend the burger. Simple, massive, and perfect, you wont leave disappointed. The café, open until an hour after the lift shuts, is situated just about 100 metres from the bottom of the tracks, and the 180-degree wrap around deck provides excellent viewing of the last few hucks on Airtearoa. Talk about a scenic place for a beer! 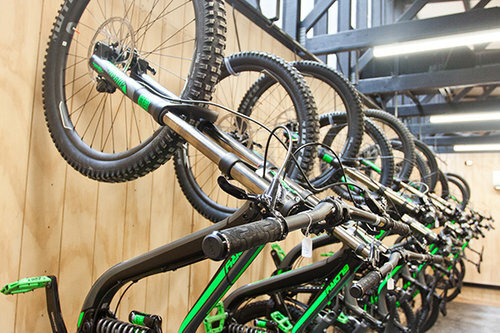 For those who cant get enough adrenaline rush packed in to just mountain biking, CAP offers more! There is a zip line tour with 4 zips and every single of of them is a “dual” zip line, meaning you can race a friend to the finish! Even daredevils will be impressed by the “hands free” zip, and then especially the final zip line, an extraordinary 1,100-meter plunge back down to CAP headquarters. Christchurch Adventure Park has undoubtedly put Christchurch back on the map for mountain bikers and has quickly become a favourite destination for our expert MTB guides, and best of all the use of the tracks is completely free! That is, if you are happy to pedal up on your own steam! Use of the lift can be purchased in the form of 3-lift, 10-lift, day passes, season passes and more. The park warrants at least a full day of riding to be sure- and then the (now less crowded!) Port Hills and Godly Head tracks are worth exploring as well.